Wouldn’t it be great to be able to hand out business cards that proclaim you a ‘professional sleeper’, or fortune cookie writer? Of course, for every curiously awesome job, there’s a foul, wretched one – like vomit collector at an amusement park or waste-burning toilet attendant on a ship. To get any of these 13 weird gigs, you either have to be really lucky – or really desperate. Inevitably, some people who can’t handle the twists and turns of rollercoasters end up losing their lunches. But have you ever thought about the person who has to clean it all up? 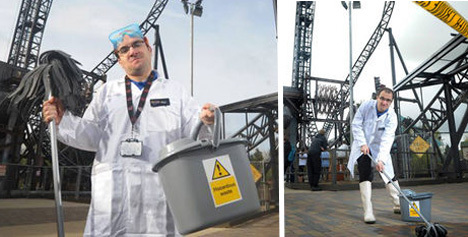 Meet Rhys Owen, the official vomit collector at Thorpe Park, a theme park in England. The park needed a dedicated ‘chunder-cleaner’, as they so charmingly put it in Britain, for a particularly stomach-churning ride. Store shelves are packed with all kinds of deodorant – and some work better than others. But who determines whether a deodorant is actually effective? Since test subjects can’t necessarily be trusted to evaluate their own bodily odors, odor testers have to step in and sniff for themselves. It’s a dirty job, but someone’s gotta do it. Dumping human waste into the sea isn’t a great way of dealing with it, but seafarers can’t always just wait until they’re back on land to go. That’s where Turd Burners come in. These workers maintain and operate special toilets that burn waste so it’s converted into harmless, germ-free, odorless ashes. But they’ve got to use their nose to tell if something’s wrong with the toilet – if there’s a bad smell, something’s wrong. ‘Turd burning’ is just one of the many dirty jobs that The Discovery Channel’s Mike Rowe has had to take on. Few people have ever sniffed a can of wet dog or cat food and thought, ‘yum’. 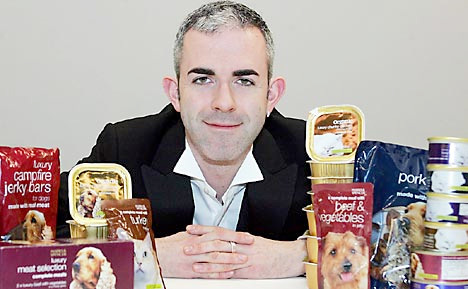 But Simon Allison tastes pet food for a living – and likes it. The senior food technologist for Marks & Spencer in the UK won’t allow anything that doesn’t pass his taste-test to go on store shelves. His favorite? Organic luxury dinner with vegetables for cats. Studying the remnants of ancient human history has a certain romanticism to it, but not everything left behind by our forefathers is pretty. Take feces, for instance. 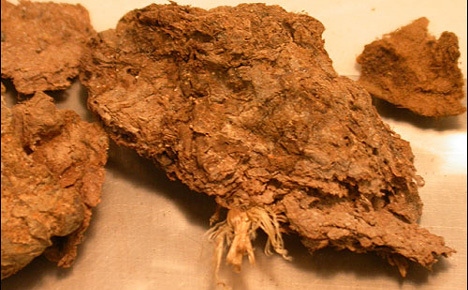 Pathoecologists like Karl Reinhard, the world’s foremost expert in ancient feces analysis, spend their days sifting through piles of dung in search of clues about our ancestors’ lives, diets and environments. 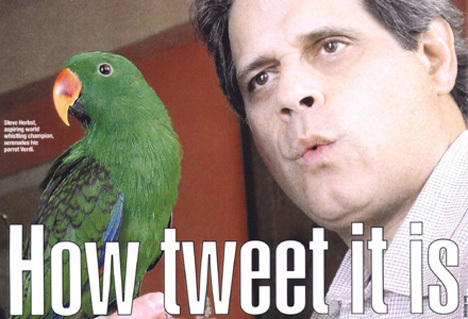 Steve Herbst gets paid to whistle. “I’d like to be the go-to guy for whoever is looking for a whistler,” Herbst – an advertising VP who hasn’t given up his day job yet – told the NY Post. As a child, Herbst’s parents brought him to dinner parties to entertain guests, and he has since performed at Carnegie Hall and on television. “I don’t think it’s a stretch to say I can hold my own with a symphony orchestra,” he says. While there are many illustrators making admirable earnings doing what they love, few have so specific a subject as James Niehues. 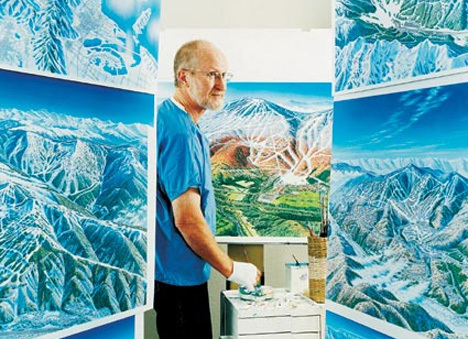 Commissioned by ski resorts to make super-accurate renderings, Niehues now sells his originals through an art broker and hopes to move on to national parks. For all the balls they accidentally knock into the water, few golfers wade in and try to retrieve them. That’s what golf ball divers are for. Golf equipment stores selling ‘gently used’ golf balls often pay several independent golf ball divers to gather as many of the errant balls as they can, usually for about 6 cents each. 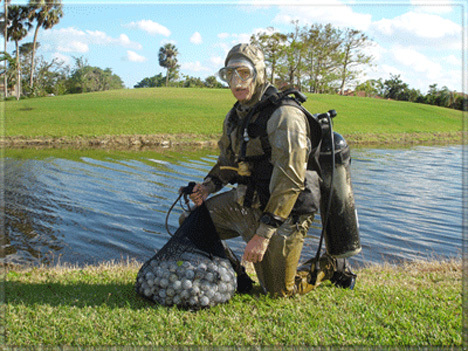 Some estimates put golf ball divers’ salaries at over $100,000 a year, but it can be a dangerous job – a 75-year-old man died while diving for golf balls, 27 years after his son perished the same way. Many of us sleep on the job – but if we got caught, we’d be heading to the unemployment line. But there are some people who actually get paid to snooze. 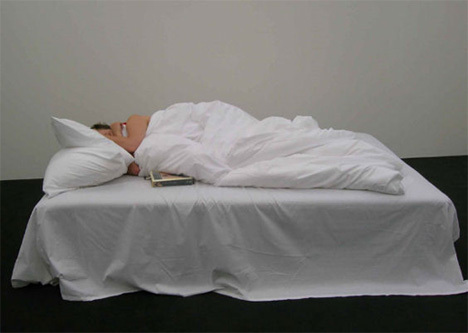 This type of job typically involves participating in sleep research projects at hospitals and universities, but there are even stranger ways to be a professional sleeper. The New Museum of Contemporary Art put out want ads in January 2009 seeking women willing to come in, take a sleeping pill and zonk out during the museum’s opening hours. The women who got the jobs then became living museum exhibitions titled after their own names, such as ‘This is Kate’, pictured above. They come out at night, wearing miner’s hats with headlamps and cans strapped around their ankles. Seeking out wet spots with lots of worms coming up to surface, they grab the slimy little creatures and put them in the cans. 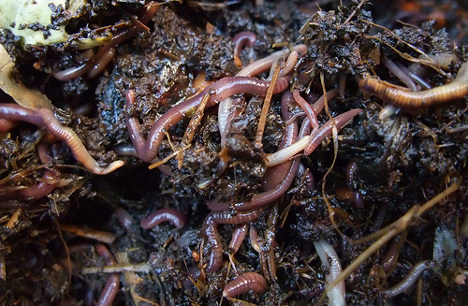 Good-quality worms fetch up to $18 per can. Professional worm picking may be a weird job, but it can be more dangerous than it sounds – especially when competing worm pickers get territorial. In Canada in 1993, rival worm-picking groups got in a violent fight that involved steel pipes and setting a van on fire – all over the most lowly of invertebrates. Donald Lau used to find inspiration everywhere, writing gems like “”Beware of odors from unfamiliar sources” after a memorably stinky ride on the subway. But these days, the VP of Long Island City’s Wonton Food, Inc. is recycling fortunes. In 1995, after 11 years of jotting down any insightful thought that came to him, Lau gave up on trying to be original. 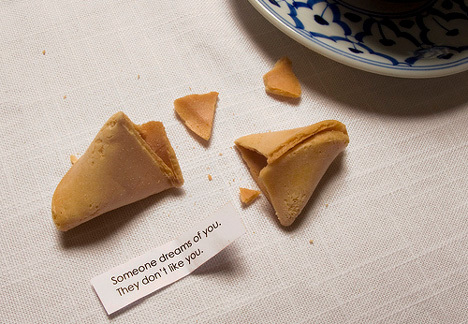 Such jobs are few and far between, but Lau finally put out a want ad for a new fortune writer in 2005. Even the smallest imperfection in a dice can skew the odds, causing it to land on a particular side more often than the others. 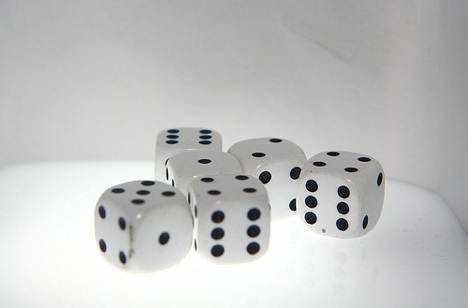 Hence, the need for dice inspectors – people who carefully examine dice for blemishes, incorrect proportions and angles that are even the slightest bit off. Such quality control inspectors are found in practically every industry, so there are strange ‘inspectors’ of all sorts. Snake venom is powerful stuff – just as it can be extremely harmful to people and animals if we’re bitten, it can also heal. Not only is it needed for antivenin, but it is also being applied in medical research for pharmaceuticals that may help stroke victims, or treat malignant tumors. 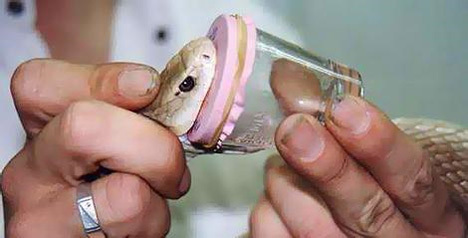 Snake milkers stretch a thin membrane over a glass or plastic receptacle, induce the snake to bite through the membrane and apply pressure to the snake’s venom glands to collect the venom. Another method involves electrical stimulation.